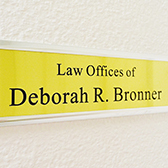 Our law firm was recently featured on My Local Buzz TV, as Deborah explained how the Los Angeles-based Law Offices of Deborah R. Bronner can quickly and effectively fight off a home foreclosure for anyone living anywhere in Southern California. We fight all types of evictions, we have stopped foreclosure sales within days -- even hours -- of a house appearing on the auction block. Our office gets back foreclosed homes and restore full ownership to our clients. Deborah R. Bronner has handled hundreds of loan modification cases and obtained significant reductions in mortgage payments. We are a strong team of experienced professionals who fully understand and respect your needs, delivering personal attention to the details of every case with unwavering persistence and commitment. Ms. Bronner has practiced in the debtor/creditor arena for over two decades. She has provided legal services to the mortgage and real estate industries as well as to individuals. Clients from all walks of life have benefited. We hope you will take the time to watch this short video, share it with your friends and social media contacts, and check this page often as we'll upload new content as it becomes available. Simply click the "play" button to begin watching. (Feel free to click the "share" hyperlink atop the screen to let others know how our law office can help your loved ones in their time of need).